Full-time National Servicemen (NSFs) from all vocations in the Singapore Armed Forces, Singapore Police Force and the Singapore Civil Defence Force have gone down on their knees to apologise to Hilary, an ex-Singapore Airlines stewardess. 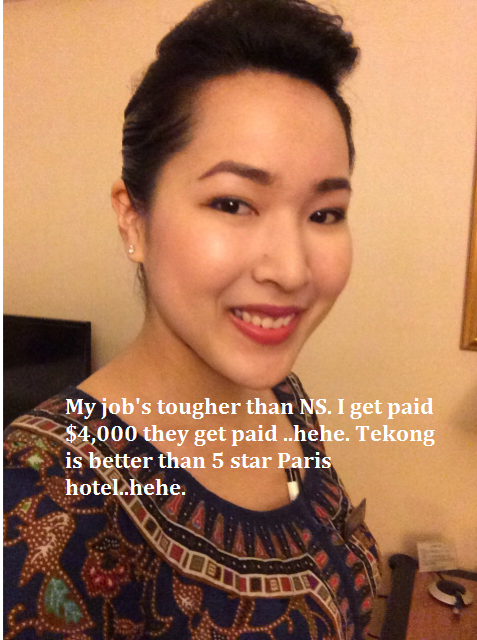 This after the Singapore Girl wrote a lengthy exposé chronicling the suffering she went through working as an air stewardess for Singapore Airlines. Her point of view about westerners and how they treated her and other flight crew really stood out. It actually said more about Singapore than anything else. Sometimes, Singaporeans cannot handle the view that they may be lacking in courtesy. Quite frankly, I find the NSF apologies uncalled for. They have obviously forgotten about comparing oranges with oranges and apples with apples. To cut a long story short, the basic salary of SQ crew is pittance, but but its overall package is good although there are differences with other alrlines that are better in terms of travel benefits that are transferrable as in the case of QANTAS. Parents are known to be afraid to discipline their children and tend to pass the buck to school teachers and other institutions. Criminals are not made in the streets. They are all made at home. I live in a unit that has a lift right in front of my unit and a Singaporean family on my right. Now and then, whenever my neighbour is there to take the lift, I greet him "Good Morning ". Since then, whenever he sees me at the lift, he'll make a right turn and take the stairs. I believed he's a typical Singaporean afraid even of friendly confrontations and small talks. Whereas my other Caucasian neighbours and my family always exchange greetings. Hilarys's opinion on Singaporeans is truly rather typical and seem as socially handicapped. In general, We Singaporeans need to improve on our basic social manners which is rather lacking.